Avoiding Corpse Creation: Corpses can very quickly reduce a winning player's score to dust, each corpse taking over a minute of Robosaru's passive income to recover. Prevention is better than the cure! Detonating Bunny-worn Collars leaves a corpse. Thus it should be only done when the Bunny needs to die with urgency, is in cover preventing the Robo from landing hits with the Primary Cannon, or near items Robosaru does not wish to damage with Missiles. Item Destruction: Shooting the Primary Cannon or Missiles near items, placed or dropped, can risk destroying them. Sometimes Collar Remote Detonation or using the Flamethrower is better in these circumstances. Eliminate Campers: The rotation indicator on Robosaru's HUD has a red notch on it. Pointing the turret all the way down and burning along the red notch scorches the door area, guaranteeing that no bunnies remain alive there. Eliminate Climbers: Bunnies that manage to climb onto Robosaru can be cleansed using the Flamethrower, which kills any Bunnies within a large radius of the nozzle due to the heat. Manage Corpse Factories: Hidden corpse factories are every Robo's nightmare. Corpse factories can be spotted when they are used since they emit a small flash of light and stay illuminated (even if behind cover) for a short period of time as the fire from a newly created corpse burns out. It's up to Robosaru what is done with corpse factories. They can be destroyed with missiles for piece of mind, or left standing if you know where they are in order to lure bunnies into wasting time trying to reach them. (And then destroying any corpses that are retrieved from them) The Robo may also want to leave them standing if they suspect that they are close to being subverted: once returned to a bunny, the factory becomes an asset rather than a liability. Let Collared Bunnies Live: Especially at times when there is no dropship, letting collared bunnies live if they are far away is a much better strategy than simply killing them because you know where they are. Insofar as you know where a bunny is: you are safe from them. Distraction: Bunny players tend to be more subversive when they have nothing to do. Placing money for them to grab or getting them to dance or race are ways to keep them occupied until the dropship arrives. Coercion: depending on the situation, bunnies can be forced to load in more items for little or no auto-pay. Consider their funds / ability / desire to crash your ship. If a combination of those factors is low, the bunnies can be more easily coerced. Honey Pot: Especially in the beginning of the match, when the game is most chaotic, dropping money in an open area can draw the bunnies out to grab it. If robo is able to consolidate the bunnies in a particular location, it can make it safe enough to buy a dropship and consolidate control further. Robo: Don't use that feed box. Bunny: but it's closer I am just going to put x thing in. Immediately after bunny deposits, Robo dispatches bunny before they can collect the auto pay. Fake Out: as robo it is sometimes best to let a player believe that you don't see them until they are out in the open and away from valuables before doing away with them. This is a powerful strategy as it wastes the time of the bunny player who thinks he is making progress towards subversion. Strict Corpse Policy: Typically a bunny carrying a corpse is a big no-no except when under direct orders to carry them, but bunny players often will claim they were "moving the corpse away" or "picked it up by mistake" or otherwise give a reason to carry them. Letting such a bunny live could signal that you can be pushed/manipulated but also that you can be worked with. Killing such a bunny instantly will signal that there will be no tolerance of misbehavior. Benevolent Iron Fist: Going full-on iron fist (or a spawn-killer as an extreme) as a robo often leads to extremely subversive and disobedient bunnies that will automatically team up to subvert you. Being too benevolent can lead to being easily subverted and possibly even ending your reign with less money than you started with. Therefore many players adopt a mixed strategy where they try to strike a balance in order to consolidate and extend their reign as long as possible. Dez, for example, is known for rewarding OBEYing and snitching players well. Keep 'em Busy: If the round is ending or you simply want to buy time, it is often a good idea to have bunnies do things with cheap items. As stated above, bored bunnies tend to be subversive, so having them build elaborate laser walls or load cheap items can be better than having them waiting (and likely notice that they are running out of time). Collective Punishment: Some robo players have been known to employ collective punishment strategies where if any bunny is missing or is not wearing their collar, auto pay is reduced until the missing player is found/puts on their collar. Sometimes this can have the desired effect of having the other players to turn into scouts for the robot (making it practically impossible for the missing player to subvert), but it can also sometimes lead players who were OBEYing to reject the policy and rebel. Consolidate First! : The first thing a robo should do on subversion is to try to locate all bunnies. There are some ways to help. Firstly, even before subverting you should decide whether you want a dropship or not. If you know you want to try to control the others and there is no dropship, press P just BEFORE subverting! This will insta-buy a ship when you get in so that the old robo and anyone else killed by the sentries will be locked in the new ship without you doing anything more! Then you should look at how many bunnies you are against in the top left corner of your HUD, and zoom out and look for collars. All good players are always counting bunnies to make sure they know where everyone is. Any loose bunnies would have automatically been given collars so they will be near those orange triangles! Immediately kill any bunnies that are not doing something helpful or far from the drop zone, sending them to the new ship as well. Thus begins a healthy reign! Battery Flood: Batteries are arguably the most powerful item in OBEY. Only buying batteries will force bunnies to load them in (being attentive to experienced bunnies who will often try to hide them instead of load them). This strategy has an important extension: assuming robo is able to force bunnies to load enough batteries into the box, robo can then destroy all collars in the map and then spawn kill all opponents. If the opponents are not foresighted enough they will destroy the dropship without buying collars, locking them into an impossible situation where robo has enough batteries to last several minutes (ideally enough time to reach a win condition), and bunnies lack collars to bypass sentries (and also lack of a way to obtain new collars). Robo can seal a game against bunnies this way. This strategy should be used with caution as experienced bunnies will most likely to rebel if they figure out it is being employed against them. Salt the fields: If a robo player has a score approaching the win condition, but is in fear of subversion, it is often attempted to turn the map into an unplayable hell for the next robo. Not only wasting the Robosaru's ammo, but generating many corpses can be counted on to make the next robo's reign exceptionally dangerous and short, thereby cementing the lead of the first robot. Use the Dropship Shadow: A good time for running away is when the dropship comes. You can hide and even drop your collar out of sight of robo if you are inside the shadow of the dropship when it lands. But even if you are not, most robos will take a few seconds to observe the landing area and try to establish order on whoever falls out. This can be a good opportunity to run. Risk Timing: A good time to take risks is when the dropship is coming in for a landing (you can see it in the sky when it has less than 30 seconds left to land). If you are killed, you will not remain in there long and not lose much money or time. Any player who enters Robosaru instantly earns 300¢, regardless of the duration of their reign. The very first player to enter robo is forced to instantly buy a dropship, starting them at $300 -$1500 = -$1200. Any player to enter Robosaru will activate the sentries, very frequently killing multiple bunnies who were also racing for the door. It is not uncommon for a double subversion to occur if the second Bunny is right on the heels of the first. They will be able to subvert the first bunny almost instantly, in the split second the sentries take to come online. Bunnies who are within range of the sentries when they are activated are not given collars, but if they are behind cover they are protected from the sentry shocks. 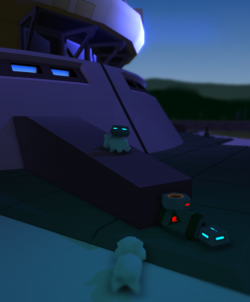 They can easily subvert once the 15 seconds is up: since they lack a collar, Robosaru will have difficulty locating survivors of the initial sentry activation. Bunnies who are not within range of the sentries when they are activated are given collars, allowing them to walk through the sentry ring while it is active, at the cost of being locatable by Robosaru. A bunny can often counter this by travelling to Robosaru's far right or left before the initial subversion occurs, so that they are out of sight. Laser Wall Efficiency: If you wish to place Laser Walls efficiently, they should be arranged 6 squares apart. This is the width of 2 concrete-terrain tiles. Remember that efficiently-placed Laser Fences, although cheaper for the Robo, will create larger defensive holes when a single pole is destroyed. Mine Use: Mines can be used to destroy Laser Walls. Make sure Robo does not see you carrying these or placing them near his items, as Mines will destroy them too. A common strategy is to buy a mine and place it in the pile of items recently purchased by robo. Another bunny will approach to begin loading items and will explode themselves along with the valuables. Propping: when items are placed in the same location, the most recently placed item will jump to the top of the stack. Bunnies will also stack on top of items and terrain, so you can raise fellow Bunnies by placing items underneath them. This can be used to climb over laser walls, and climb onto Robosaru. Staircase: to overcome obstacles such as Laser Walls, or even to mount Robosaru. Uranium and Fuel cannot be climbed onto from the ground, but a dropped Collar or Sensor utilized as a step will allow a Bunny to mount them. The tallest object that can be climbed onto using a Collar or Sensor in this fashion is the Large Scrap: Enrichment Unit when approaching it from its square end. Corpse Factory: bunnies can place two laser walls next to each other to make a "corpse factory". These can be hidden behind rocks, or even behind the Feed Box itself if it is far enough from Robosaru. Some bunnies are even bold enough to ask for laser walls so that robo will finance his own corpse factory! If a Dropship exists, solo corpsing a Robo faster than he makes money is a little tricky to do, and impossible to do once the Robo player starts obtaining a sizable unbroken reign bonus. Solo corpse bombing is still a valuable strategy, as long as the other bunnies are not just simply OBEYing. Concealing Items: Items can be hidden from Robosaru's view by carrying a large item on your back, and the item you want to hide on either your left or right side. Then you can turn your bunny so the side the item is on is away from Robosaru. Loading rockets: Due to the fact that rockets can be purchased at 50¢ but auto-pay can be turned up to 100¢, it is possible to use rockets to slowly bleed an inattentive robo player by bunnies purchasing rockets, provided Autopay is high. A similar strategy can be done with Scrap, but is less repeatable since Scrap cannot be bought. Stashing: If robo is not looking, bunnies can take items meant to go into the feed box and simply place them out of view. Hidden items are in effect lost ¢ undertaken by the robo player that purchased them. This works especially well when dropping items into the wall of a cliff: The items will appear at the top of the cliff, unreachable to bunnies. Scumbag Bunny: A frequent strategy is "scumbagging", where a Bunny hangs around the Feed Box and attempts to steal other bunnies' autopay. This can be countered by imagining the Feed Box is a circle: the point at which you place the item is is the angle from the Feed Box the autopay will be Dropped. Simply by turning your bunny, you can cause autopay to drop a large distance away from the scumbagging bunny. Item Shield: A Bunny can stack tall, valuable items such as Uranium, Fuel, and Batteries on top of eachother to build a shield that Robosaru cannot shoot through without destroying his own items. Missiles shot past the shield also destroy the items if they are within the blast radius. The flamethrower can be used to kill the bunny behind the shield, but then Robosaru has created a corpse that he cannot see nor destroy. The best thing about the shield is that 3 items, the amount of items a bunny can carry is enough to build one, and it can be quickly erected by holding the Drop button and scrolling down/up. Item shields are also useful against sentries. Sentries must have line of sight to destroy a bunny. Quickly building a shield when they come on can be used to block the electrical arc, if a bunny reacts quickly enough. Kamikaze: Walking into the robo while carrying corpses splits the penalty for those corpses between the new and the old robo. So if the existing robo is very close to winning, it may be desirable to take a loss yourself when you subvert in order to bring the leader back down and buy some time. However, the old robo's score can not be damaged more than your own score. For example: if your score is 1000, and robo's is 9000, even if you walk in with 3 corpses, both you and robo will only lose 1000¢ (you will be 0, robo will be 8000), even though total damage by the corpses should have been a minimum of -1500 for each of you (since each corpse is at least -1000). Bunny Caging: If a bunny sets up Laser Walls around the Drop Zone, it becomes almost impossible for newly spawning Bunnies to escape without stacking items underneath each other or setting off a mine to destroy the poles. While it is highly unlikely that Robosaru will be able to coerce the Bunnies to do this to themselves, it does become a possible strategy for a bunny to employ against another bunny who is nearing victory, by blocking them from earning autopay from the Feed Box. 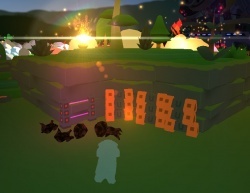 A current bug with the Laser Fences allows them to be deactivated if the network is updated (usually by placing another Laser Fence) while there is a sizable obstruction between two Laser Fences. Avoid "Conceding": When the Robosaru player is very high on the scoreboard, such as 80% of the victory condition or more, it is unwise in general to place Uranium into the Feed Box. Even if you "Only place one in", remember that if all other bunnies did so too in the instance that they were also not paying attention to the scoreboard, the round would end very quickly. The Feed Box removes from play any item that is placed in it. This can be used to dispose of your Collar without evidence, unless the player in Robosaru is aware of how many Collars are in existence and deduces that this strategy has been used due to the absence of one. Always wear a collar while you aren't planning on disOBEYing. The collar gives you a severely increased income while held or worn, and that money can be used to keep up with the Robosaru player, or to be later used to crash the Dropship. If you have been sent to the Dropship, and you are aware that there are no Collars on the map, purchasing the collar in the Dropship will give you an advantage over all other players who do not own one. A collar will earn back its worth within 20 seconds of wearing one in the field. A dropped collar gives the Robo player an indication of which direction you have traveled. Consider where you place your collar, and where it will cause the Robo to look. It is extremely unwise for Robosaru to detonate your collar if you are near (especially behind) the Feed Box. Use this to your advantage. Note that these techniques will vary in effectiveness depending on the player they are being used on. Look over there! : A golden rule to play by is to trick Robosaru into "looking where you are not". You will have a far easier time approaching Robosaru undetected. Building Trust: Some players will be very helpful to the robo player, building trust over time enough to get close before attempting subversion. This strategy is viable because the player doing this will have a collar on more time, be in the dropship less, and gather more auto-pay than other players (all forms of earning more money). BS Strategy: Some players will talk excessively to keep the robot from concentrating on bunny positions and activities. This sometimes works, but other times can cause the robot player to retaliate against the distracting player. Impersonation: This is a strategy generally used by experienced players where they will answer for other players and/or pretend to be other players in order to make the robot player think that they have the most dangerous opponents under control when in fact they do not. Compulsive Lying: Constant lying to the robot can sometimes coincidentally cause impersonation and/or other 'impossible' situations for the robot to cause them to lose control. A compulsive liar, once called wolf thrice, can then use reverse psychology to abuse the Robo's "trust" in their lying. They can then tell the truth about things that they wouldn't want the Robosaru to know, for instance, their location if they are attempting a subversion, causing the Robo to do the opposite of what they tell them. Panic Strategy: Tricking Robo into thinking you are close can cause him to panic and use his sentry ammo, so he will be empty when you decide to make your approach. This will work with other weapons like Flamethrower and Missile Ammo, but coercing usage of Sentry Ammo is by far the most reliable. This strategy should be tempered with the knowledge that whatever the Robo player wasted, will also not be available to yourself if you are able to subvert. Spotlight Pattern: When attempting a subversion, ensure that you are familiar with Robo's "search sweeps". Most players will have a pattern for where they look, and how frequently they view each area. Some players will check over large areas, giving time between sweeps, while others will check rapidly over small areas, giving blind spots. Living Distraction: Sometimes you may need to intentionally disOBEY (and verbally declare reasons, especially to draw out the questioning process) within view of Robosaru, to give a fellow Bunny time to disOBEY or subvert. Knowing when to Pounce: Constantly trying to subvert an experienced robo player will most likely lead to constant trips to the dropship. It's usually better to intentionally decide when is a good time to make a run for the door. The best time to pounce is if a robo player panics. If you see a robot player shooting randomly or in every direction, that is one of the best opportunities to make a run for the door. He will most likely not see you among the smoke and lights. Inducing panic is also a good corollary to this strategy. Winning Without Robo: It is not infrequent for a bunny to win a match without ever entering the robot. This strategy tends to be more effective the more players there are in the session. As players fight each other for control (playing the high risk/high reward game of controlling Robosaru) simply playing the obedient bunny can lead to a significant lead over players that for the most part are losing big against each other and taking pains to destroy each other. Quietly and consistently OBEYing on the sidelines while the "rats fight over scraps" is a powerful and winning strategy when used in the right situations. This page was last modified on 14 January 2016, at 16:33. This page has been accessed 88,250 times.